Fibre is famous for being able to provide high bandwidth connections. Sometime it is seen as being in competition with Wireless network solutions and even cloud applications. But in reality there is no competition those very networks use fibre within their own infrastructure. So the question is not whether or not to use fibre. It is just whether to connect to it directly, or via a service provider. Fibre has become the go-to solution for any type of fixed network whether within an office building, a data centre, within a city across a country or between continents. The details of each solution vary depending on the application. Fibre is capable of many things but often its potential is underestimated. It can be used for very low speed connections in the kilobit per second range such as for connections to data loggers and control systems, for medium speed connections such as voice communications or for high speed connections in the 100Mb to 1Gb/s range such as Fibre Broadband connections. Fibre connections in the Terabit per second range used by ISPs to connect 1000s of users to the Internet, and even rates in the 1000Tb range are used to connect between countries and across oceans. But in essence the fibre is all the same. The difference between them is the connected equipment! Less well known Capabilities: Fibre’s capability does not stop with mere simple high speed point to point connections because it can also provide branches and complex networks in rings and chains in order to connect many locations to the same network. Did you know that a single fibre can pass data in both directions at the same time? So applications that we use fibre for very considerably, as do the terms we use describe them. Utility Network is a term used for specialised industrial applications often running at relatively low speeds and perhaps benefiting from Fibre’s immunity to the electrical interference that can often be found in industrial settings. Often these are regarded as legacy networks because often they use network protocols that have long ago fallen out of common use elsewhere, but they are of critical importance due to their connections into critical systems such as traffic signals, pumps and valves, sensors and many things besides. Voice networks are often associated with the traditional Copper based fixed telephone network. These are increasingly being replaced by Voice on IP VoIP solutions and Mobile networks but even those legacy systems use fibre in the 2Mb to 155Mb range because they were used to connect many 100s or 100s of voice calls at the same time. ISP & Broadband Networks are used to deliver internet connections for residential and small enterprise customers. These may use Copper or Fibre although of course it is now widely accepted that Fibre is the way forward. Nevertheless copper broadband often have some fibre within them running at perhaps 1Gigabit/s. Data Centre Networks are a specialist type that has recently come to prominence due to the emergence of ‘cloud’ applications and servers that in reality need to be housed somewhere. Often supporting 100s, 1000s of users, or even more they require ultra fast bandwidth connections, high reliability, low latency and often support for unusual network protocols such as Fibre Channel. 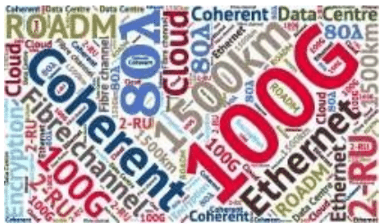 Connectivity rates are usually in the range of 1 Gigagbit to 100 Gigabits per second and they may bet terminated in Data Centre at both ends, or at a customer premises. Within the Data Centre itself they may be terminated in a ‘Meet Me’ room or may connect all the way to the server rack. Mobile Backhaul Networks are used by mobile operators to connect to the radio towers one sees alongside motorways etc. Actually a wireless contains a lot of fixed fibre. Often these are quite slow in the 2Mb/s range but newer 3 and 4G mobile networks use fast speeds such as 100Mb/s – on fibre of course but also often via fixed radio links (this subject is a major issue as we begin to prepare for 5G). Long Haul Networks are those that connect cities together. They may be a few 100km or a 1,000km. Other Networks. Specialist customers and applications can use fibre at almost any speed, whether it’s a trans-Atlantic connection at Terabytes per second or specialist rates for Data centre connections at 4, 8 or 16Gb/s or even connections for the specialised connections used by Ultra High Definition cameras. 270Mb/s to 3Gb/s, of course they all use fibre! Sorrento understands all of these network types and uses its range of a solutions together with the extensive history and experience of its engineers in order to provide it customers’ network bandwidth and ROI with cost effective and easy to maintain products.